CME's old friends, also the endorsers of CME, Ujiie and Hideki came to CME booth as well. Although they had to make presentations and performance on the fair, they still came to have a look at the ASX analogue synthesis expansion which was announce newly in Japan. Ujiie and Hideki are respectively the chairman and cochairman of the Japanese synthesis programmer association. They are the senior master in Japan digital instrument industry and have professional experience and knowledge about the synthesizer development. They were surprised when they saw the ASX analogue synthesis expansion which contains opened DSP platform within it. Since the ASX features the ability of expansively downloading various algorithms and types of analogue analysis, it converts the VX & UF into the unique platform analogue synthesis expansion in the world. 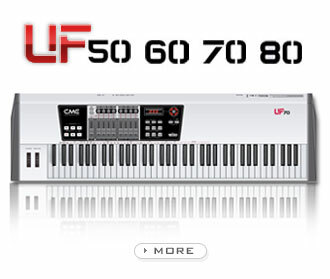 It breaks the closure concept of synthesizer as applied by the top three Japanese brands Yamaha, Roland and Korg, and provides the great worthiness and convenience to customers. As the endorser of CME, Ujiie and Hideki are always concerning the development of CME. They are looking forward to more creative CME products and they would be pleased to introduce and recommend CME products to all of the members of the Japanese synthesis programmer association.